PHILADELPHIA (CN) – A pair of Republicans who caused a massive traffic jam in New Jersey to punish a political opponent of then-Governor Chris Christie failed Tuesday to unravel the bulk of their convictions at the Third Circuit. Bridgegate, as the scandal became known, made headlines in 2014 after news outlets got a hold of emails and texts between three Christie cronies: his deputy chief of staff Bridget Ann Kelly and Bill Baroni and David Wildstein, two men Christie appointed to the Port Authority of New York and New Jersey, a bistate agency that controls among other things the George Washington Bridge. “Time for some traffic problems in Fort Lee,” Kelly had said in one particularly incriminating email. In the days preceding that message, the Democratic mayor of Fort Lee had intimated that he would not be endorsing Christie’s re-election. 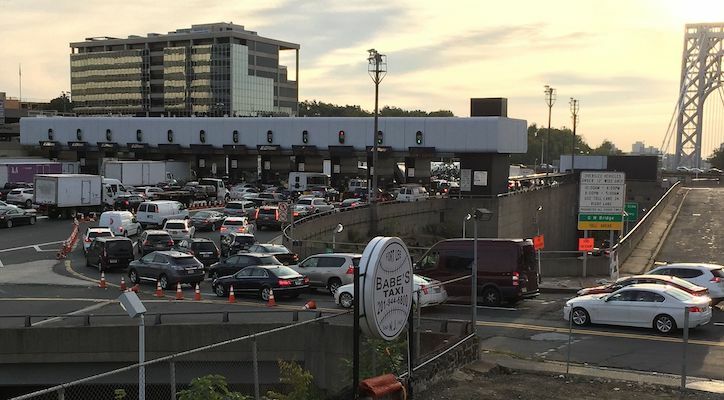 Fort Lee sits on the New Jersey side of the GW and shortly thereafter found two of its usual lanes leading onto the bridge closed for four days, snarling thousands of commuters, emergency vehicles and school buses in gridlock traffic. After Kelly and Baroni were convicted on nine counts each, the duo brought their appeals last year to the Philadelphia-based Third Circuit. Attorneys for the duo insisted that their actions may have been “nasty politics” but not criminal. The Third Circuit upheld the bulk of their convictions Tuesday, however, finding that they misused Port Authority resources and that Baroni invented the cover story of a traffic study to authorize the realignment of traffic lanes that he was otherwise not authorized to manipulate. Kelly and Baroni also failed to persuade the court that their actions did not cost the Port Authority more than $5,000 — a crucial threshold under the misuse claim. Pointing to overtime paid to the toll workers and the money spent on the fake study, Scirica found the damages well above the threshold. Scirica also ruled against Baroni and Kelly on their argument that U.S. District Court Judge Susan Wigenton improperly instructed the jury during their trial to ignore whether they intended to punish Fort Lee’s mayor. In a minor win for the defendants, however, the Third Circuit opted to reverse their civil rights charges, which were based on the idea that Baroni and Kelly had violated travelers’ right to intrastate travel by snarling traffic across the bridge and in Fort Lee. “Simply put, although four circuits (including our own) have found some form of a constitutional right to intrastate travel, there is hardly a ‘robust consensus’ that the right exists, let alone clarity as to its contours,” the 78-page ruling states. A spokesman for the U.S. Attorney’s Office in New Jersey said the office is looking at the ruling. Baroni, a former appointee to the Port Authority of New York and New Jersey, faces two years in jail, while Kelly faces 18 months. Both will now likely be resentenced. Kelly’s attorney Michael Critchley called himself “disappointed” in today’s outcome, saying they intend to appeal the remaining charges to the U.S. Supreme Court. “We still believe that the remaining charges are not legally sustainable and intend to petition the United States Supreme Court to review this case,” he said. Baroni’s attorney Michael Levy of Sidley Austin also indicated that they may appeal. “We are gratified that the Court of Appeals concluded that Bill Baroni did not violate anyone’s constitutional rights and his sentence has now been vacated,” Levy said in a statement. Wildstein cut a plea deal and served as the government’s star witness as it brought Baroni and Kelly to trial in 2016. He received probation for his testimony and currently is operating the political site New Jersey Globe.